Every war has an environmental cost. Armies have been known to degrade the environment, burn fields and forests and poison water sources. Advances in weapon technology have left their mark in innumerable places, the most noticeable being Hiroshima and Nagasaki. Recently, NATO bombing of a petrochemical plant in Belgrade has raised questions about its environmental fallout. Yet the most outstanding price of war is the human cost. Almost 149 million people have died in major wars around the world since the 1st century, two-thirds of them in the 20th century. 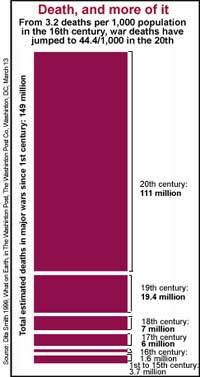 The two world wars claimed 79,547,000 lives.